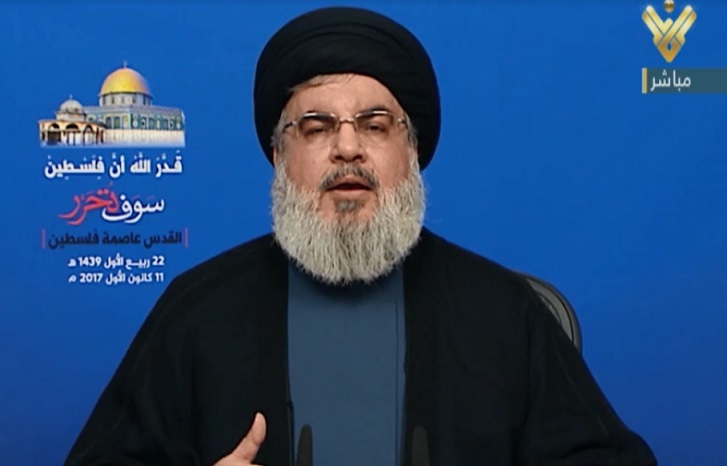 Hezbollah Secretary General His Eminence Sayyed Nasrallah delivered on Monday a speech in which he called the Palestinian people to launch a new Intifada in face of US President Donald Trump’s decision to recognize Occupied Al-Quds as a capital of the “Israeli” apartheid entity. Meanwhile, Sayyed Nasrallah hailed and saluted the Palestinian people in Gaza, West Bank, Al-Quds and entire 1948 lands as they rushed to face Trump’s declaration of Al-Quds as the capital of the “Israeli” entity. “The steadfast and defiant Palestinian people today faces with their chests, stones and knives, this aggression to defend Al-Quds and the sanctities of the whole nation,” he said. “Arab and Islamic governments must immunize the stances of the European nations that have rejected Trump’s decision,” he emphasized. His Eminence further thanked the Yemeni as well as great stance taken by the Lebanese government in response to Trump’s decision. “To the people of al-Quds and Palestine, beat any delegation that comes to normalize ties with “Israel” with slippers and stone it because they do not represent their people,” he said. Hailing all Palestinians in diaspora, Sayyed Nasrallah praised their commitment to their right to return to Palestine. “I salute the people of Gaza, in the West Bank, in 1948 lands for their positions since Trump’s decision. These people have all our respect and gratitude as they have sacrificed so much, and have defended the Occupied land,” he stated. “The US is the maker of “Israel” and the sponsor of terrorism, occupation, Judaization, displacement, burning, destruction and sedition,” he clarified, pointing out that “the US is the founder of Daesh and other takfiri groups. “We will not leave Palestine, Al-Quds and Al-Aqsa Mosque because it represents the title for which Imam Hussein was martyred,” Sayyed Nasrallah vowed. “On behalf of the entire Resistance axis, that is emerging victorious, strong and firm despite all recent pressures and crises and as well with all wounds and pains, I declare that we will once again make Al-Quds and Palestine on top of our priorities,” he announced. “Let us lay out a unified confrontation strategy so that we all confront under a clear and unified strategy. Let us devise a practical and operational plan in which roles would be distributed and efforts would be integrated in this grand confrontation. We in Hezbollah will fully perform our responsibilities in this regard,” Sayyed Nasrallah assured. Hezbollah Secretary General Sayyed Hasan Nasrallah assured on Monday that the decision of U S President Donald Trump was the beginning of the demise of Israel and called on the Palestinians to announce the emergence of an intifada (uprising) backed by the Arab and Islamic nations. His eminence indicated that the major response today should be boycotting the Israeli enemy, halting talks, and paralyzing all types of normalization with it, and called upon the Palestinians in specific to “kick out any delegation that comes with an intention of normalizing relations with Israel and tell them that there won’t be any negotiation or settlement before Trump pulls back his decision”. “They wanted this decision to be the beginning of the end of the Palestinian cause, and I call for this decision to be the beginning of the end of Israel,” Sayyed Nasrallah said, chanting as the crowds repeat “To Al-Quds we are going… millions of martyr we shall be”. زكي لنصر الله: لن نخذلك!